The alliance between Turkey and the U.S. should not be "black and white", said an expert, as they continue to experience rocky relations over a detained American pastor. Luke Coffey, director of the Douglas and Sarah Allison Center for Foreign Policy at Washington DC-based think tank the Heritage Foundation, expressed hope that Ankara and Washington can take a step back and look at the larger geopolitical questions and find areas where they can build on their relationship. 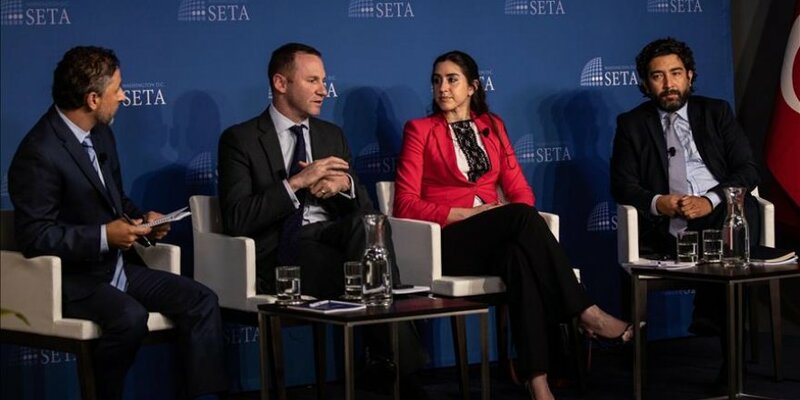 He was speaking at a panel held by Turkish think-tank the Foundation for Political, Economic and Social Research (SETA) in Washington, D.C. joined by Jennifer Miel, executive director of the U.S.-Turkey Business Council, and Kilic Bugra Kanat, research director at SETA. Both countries "need to recognize that the alliance is not black and white and let go of their unilateral expectations of how the other should act," said Coffey. He said other U.S. allies around the world are watching how Washington engages with Ankara. "There are geopolitical ramifications of how this crisis is resolved." The two allies should "come back to the table and find ways to repair their relationship, starting with the low-hanging fruit and moving forward". "In the end, there will still be a strong U.S.-Turkey partnership," he added. Miel, for her part, said the economy can be a confidence building measure in trying moments in the bilateral relationship like today. She said while U.S.-Turkey trade was looking to reach a record high this year, now it is facing sanctions, tariffs and boycotts. "To bring the economy into the political mix not only hurts the political atmosphere but hurts other ties between the U.S. and Turkey and the business communities in both countries," she added. Miel said there is high U.S. interest in the Turkish economy. Kanat said the Turkish public is very upset about U.S. actions and deeply invested in the ongoing spat between the two countries. "In every crisis, the U.S. is pushing the relationship to the breaking point," he said. He said the two countries had "an asymmetry of expectations" over a number of issues. "This crisis demonstrates that existing ties or a long history of cooperation are no guarantee that issues won't emerge between allies. He noted, however, that small steps could make a huge difference in repairing the relationship. Relations between Turkey and the U.S. soured after Washington imposed sanctions on two Turkish Cabinet ministers for not releasing an American pastor facing terrorism-related charges in Turkey. On Aug. 10, U.S. President Donald Trump ramped up his attack on Turkey by doubling U.S. tariffs on Turkish aluminum and steel imports. In retaliation, Turkey on Aug. 15 increased tariffs on several U.S.-origin products, including alcohol and tobacco products and cars.